If you went camping since the sixties you probably have fond memories of making Jiffy Pop on a grill or open fire. 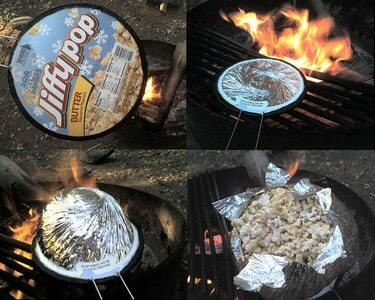 Jiffy Pop is the perfect way to make popcorn when you're away from your kitchen or handy microwave. Jiffy Pop popcorn has been a staple in American households for years. It was created by Fred Mennen in 1958. It was introduced to grocery stores everywhere in 1959 by ConAgra Foods. It was marketed as the "fun family treat". The popularity of Jiffy Pop decreased as the usage of microwave popcorn grew. This self-contained product was ingenious considering the time that it was developed. Although harder to find, Jiffy Pop is still available today. The aluminum pan has a metal handle on it. Inside, there is oil, flavoring and popping corn. The pan is covered in aluminum foil that turns in a circular fashion to accommodate the expanding popcorn inside of it, when cooked. Inspect the Jiffy Pop pan - Folks have discovered that if any part of the package has dents or imperfections they can lead to problems down the line. So be careful when you purchase Jiffy Pop that you find the ones with pristine packaging and treat them gently until you're ready to start popping. Carefully remove the cardboard cover - Be sure not to damage the foil covering underneath it. If you puncture the foil it will not rise properly during popping, drastically impacting the results. Preheat your burner to a medium heat - If you are using an electric stove be sure to preheat the burner for 3-4 minites so it is at temperature when you put the Jiffy Pop pan on to pop. Place the pan on the burner - Let the pan set still for a minute or two while the butter and/or oil that is inside comes up to temperature. Once you here a sizzling sound it's time to move on to the next step. Shake the pan in a circular motion - For satisfactory results you need to continuously and rapidly shake the pan in a clock-wise motion until the end of the popping cycle. I didn't say this would be easy! As the popcorn pops the foil will expand into a large silver ball. Remove the pan from the stove - Once the foil is completely expanded and the popping has slowed down it's time to take the pan off of the heat. Don't try to get the last few kernels to pop because you'll end up burning the popcorn at the bottom of the pan. Puncture the big foil ball with shape knife - Be careful when you do this since steam will come streaming out which could seriously burn your face or hands. Make several more cuts opening the top, turning the pan and foil into a bowl. You're now ready to enjoy a real "retro" treat. Jiffy Pop had nearly gone extinct, but with the retro movement it seems to be making a bit of a comeback. It is available at some grocery stores and in bulk at Amazon . You can check the ConAgra website for a store near you. Jiffy Pop is also handy when you're "out in the wild" away from microwaves and such. This product works well both on charcoal and gas grills. You can put the pan right on the grill but it works better if you have something like a cast iron griddle to put down first. This will normally improve your results since the heat is more even. Just be cautious because the metal handle can get very hot. The use of a potholder for the grill is a good idea. If you plan to cook Jiffy Pop popcorn over a campfire, I'll wish you luck! I'd suggest using a shovel or similar implement to extract a pile of hot coals from the campfire and cook over them rather than over the dancing flames. That would give you half a chance.